Make & Model: Honda Civic EP3. Product Type: Front Strut Brace. BEFORE - Part of the shock of impact is transferred to the chassis, causing deformation of the body and lower arm. AFTER - Equipped with Ultra Racings strut bar and lower arm bar, the shock of impact will be neutralised. A car chassis is carried by four wheels and four shock absorbers. When driving on a bumpy road, the shock of the impact will be absorbed by the shock absorber, however if the chassis is not strong enough to support the shock absorber, the shock of the impact will not all be absorbed by the shock absorber but also by the chassis, causing chassis flex. The same applies as a corner is turned, the chassis will be twisted by the force of weight transfer. Strut Bars and Chassis Strengthening Technology. In most cases, unless youre a complete petrolhead, this will be more than adequate. The first thing you should look at is a strut brace. When you corner, the whole cars chassis is twisting slightly. In the front (and perhaps at the back, but not so often) the suspension pillars will be moving relative to each other because theres no direct physical link between them. They are connected via the car body, which can flex depending on its stiffness. A strut brace bolts across the top of the engine to the tops of the two suspension posts and makes that direct physical contact. The result is that the whole front suspension setup becomes a lot more rigid and there will be virtually no movement relative to each side. In effect, youre adding the fourth side to the open box created by the subframe and the two suspension pillars. Is there a need to have our vehicle chassis strengthened? The chassis of the car is the part which experiences the most of the abuse from the driver. This is largely due to the weight transfer of the vehicle body during fast cornering, hard braking or hard acceleration. In some instances, the weight transfer during cornering may cause one side of the vehicle to experience as much as three times more force than the other side of the vehicle, causing enormous chassis flex / vehicle body deformity and twist, consequently causing tires to lose grip. What is Oversteer and Oversteer? As most modern cars go, car manufacturers employ the FF (Front engine, Front wheel drive) setup for improving driver and passenger safety. The natural behavior of an FF car is to have slight understeer, due to its heavier front end. Understeer happens when the front wheels lose their traction and wont turn any sharper, even when the steering is being corrected to turn the car more. This will cause the car to go wide instead of following the line. Understeer can be corrected by stiffening the rear end of the vehicle by adding a rear strut bar and a rear anti roll bar. Oversteer is when the rear tires lose grip causing the rear end of the vehicle to slide out of a corner. This phenomenon happens particularly to FR (Front engine, Rear wheel drive) or RR (Rear engine, Rear wheel drive) cars. Oversteer can be corrected by stiffening the front end of the vehicle by adding front strut bars and front anti roll bars. With a strengthened chassis, the vehicle will react better to tuning changes. The improvement is particularly obvious with a hard suspension setup. The chassis is also able to cope better with engine and braking system upgrades. A strengthened chassis, by Chassis Strengthening Technology, will also protect the vehicle platform improving longevity under hostile conditions, especially with a monocoque vehicle platform. If there are any delays we will notify you of such as soon as possible. For the most part deliveries will be fulfilled by courier and are usually made Monday to Friday between the hours of 8:00 to 18:00. Whatever the reason for a request to return an item the following conditions must be met. 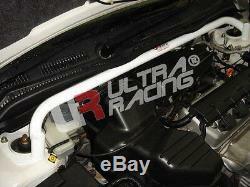 The item "Ultra Racing Front Strut Brace Honda Civic Type-R EP3 TW2-340" is in sale since Thursday, December 5, 2013. This item is in the category "Vehicle Parts & Accessories\Car Tuning & Styling\Performance Suspension\Other Performance Suspension". The seller is "crestmotorsportuk" and is located in Nottingham. This item can be shipped to United Kingdom.